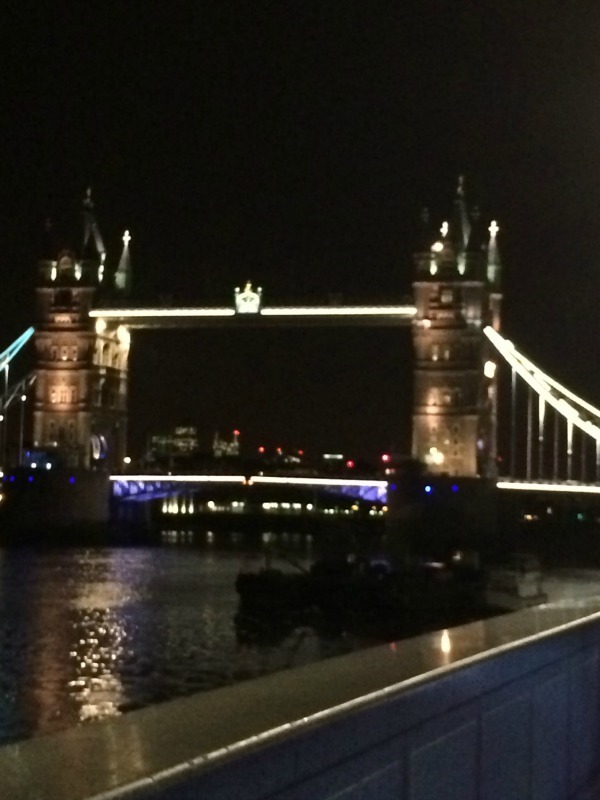 After all of my training for the Moon Walk, this weekend I walked 26.2 miles through London at night. I really wanted to have a lay in on Saturday morning to give myself the best chance of rest I could, however I was wide awake at 7am. I made sure that by the time we left for the coach after lunch to travel up to London, I was only on 2,000 steps on my Fitbit. I really didn’t want sore feet before I started the walk. We arrived at Victoria Coach Station around 4.30pm and went to have dinner in a local Wetherspoons. After wasting a couple of hours on two pints of lime and soda and a meal, we decided to head over to Clapham Common. 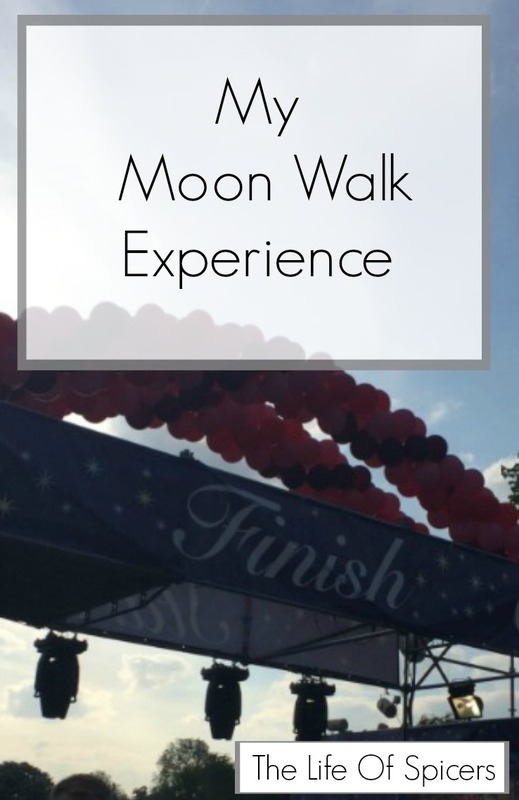 We weren’t going to be able to enter the Moon Walk area until 8pm however as we didn’t know what to expect, and we were so bored and excited just waiting around, we headed over. I’m glad we did as there were already thousands of people queuing to go in. We joined a couple of queues but were moved about according to our start number. 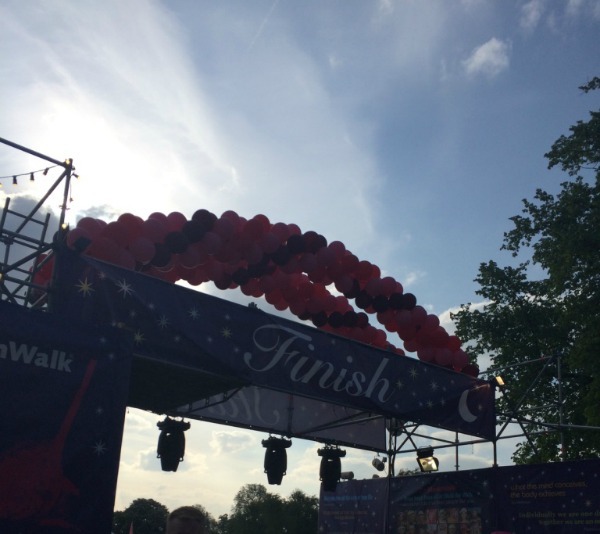 I did feel as though there could have been slightly better organisation at this point because we ended up in a huge queue snaking around the common, but when we got the front we realised the marshals were telling people who were asking to just merge in with the queue. The walkers who were only supposed to enter the walk area at 9pm were being allowed in at the same time, so it felt like organised chaos. Still we enjoyed ourselves chatting to other people in the queue. Once inside we went into the big pink tent to find somewhere to sit to sort our bags out and change shoes ready for the walk. There were walker areas according to your start number but there was no sectioning so it ended up being a little bit of a free for all. When we were sat on the floor (which was thankfully boarded over the grass so we didn’t get wet bottoms), people were stepping over us as I think there were too many people for the tent. The atmosphere was amazing though and it was great to soak it all in. After dropping our bag off in a very organised bag drop tent (I was really impressed with how this was laid out), we went to get our meal which was a pasta or rice meal. I had the rice meal and it wasn’t the best, luke warm by the time I got it, but it was fuel and that’s what I needed to I ate most of it, followed by a very sugary flapjack, also fuel that was going to be needed through the night. Water was being handed out as you needed it, in a very handy sized bottle that fit in my pocket. I was really chuffed at this because I could carry a bottle with me through the walk and not have to actually carry it. We decided to pop to the loo around 10.15pm in preparation for waiting for the warm up to get started. It all happens when you’re in the loo doesn’t it (there were plenty of toilets for everyone on the walk ground which was great), and when we came out of the toilet and back into the tent, people were starting to leave to go to the start line. We followed as we were in start group 1, however we realised we had missed our start by being in the toilet so had to go with group 2. There were no announcements to say that groups were being called outside and I wish we had known that the walkers would be starting at 10.30pm. I really thought it would be close to midnight. Still off we went with loads of other people in our group. The first four miles were spent walking and queueing at traffic lights. London really doesn’t stop does it! As we veered off the roads and through parks, it got easier. It also helped as people found their stride so the packs thinned out slightly making it a little easier to walk. It was a chilly night and not a huge amount of people considering were walking in just their bra. I popped my tee shirt back on over my bra after the photos and had a zip through fleece on. This was enough to keep me toasty as we walked. I found the first ten miles easy and very interesting. We saw so many sights such as Big Ben, The London Eye, Tower Bridge and so much more that looked amazing all lit up at night. We passed mile 13 just before we got to Buckingham Palace. I saw two walkers get into a car at this point and that sight wasn’t great for motivation as it was around 4.15am and my brain was getting very tired. Still on we walked past Buckingham Palace, not quite daylight yet which was a shame. I wasn’t inclined to take photos at that moment which I regret now. My feet were hurting at this point but as I was expecting that I wasn’t letting it get to me. The worst points were when we had to stop for the loo, which the majority of the queues weren’t that bad apart from Tower Bridge toilets that saw us queueing for half an hour. This was frustrating and it also meant we were getting cold which wasn’t ideal. Starting off again afterwards my feet took a little while to be able to find their stride. After mile 14, I started to struggle a little more as every time we stopped for the loo, I had a pain at the back of my knee. This wasn’t hurting when I walked so I was able to ignore it. The sleep deprivation didn’t start to really kick in until mile 20, which was the furthest I had every walked in training. I was pleased as I really thought I would struggle earlier in the walk than that. What I loved above all else was the volunteers, they must have been freezing standing out in the cold, but they did so well to keep everyone’s spirits up, letting us know how far to the next water or loo station, shouting good morning to us at 1am to spur us on through the night, and generally keeping motivation up. I felt sorry for the volunteers around miles 20-25 as it was more difficult to talk back to them with smiles on our faces. The last six miles for me were pure hell. It was daylight which was lovely, but the pain in my knee was now a constant pain that felt like someone was jabbing a hot poker into the back of my knee overtime I moved my leg. I was tired and my body was saying no more. I did say at one point to my friend that I was either going to throw up, pass out or cry, which would she prefer! Some how just by putting one foot in front of the other and enjoying orange segments, hot chocolate and sweets that were handed out as we walked past, I saw the 26 mile sign. I had never been so pleased to see anything in my life. The route was 26.2 miles, but I am sure the last .2 was more like half a mile to reach the finish line. I am not going to pretend it was easy, but I am so glad I completed the walk. The thought of just stopping crossed my mind a few times in that last six miles however I knew I would be so disappointed in myself and wouldn’t let myself stop. I have never known pain like it after I stopped, sat down, attempted to peel my socks off that were stuck to my feet, and then have to put fresh socks and shoes on to stop getting too cold. Getting back up off the ground was not easy and the pain in my knee meant I couldn’t bend my leg either. Getting home, having a bath and a rest was so welcome. I managed to stay awake until 5pm when I couldn’t carry on any longer. Thirteen hours later I woke up, still with a pain in my leg, but my feet wouldn’t have known anything ever happened to them. 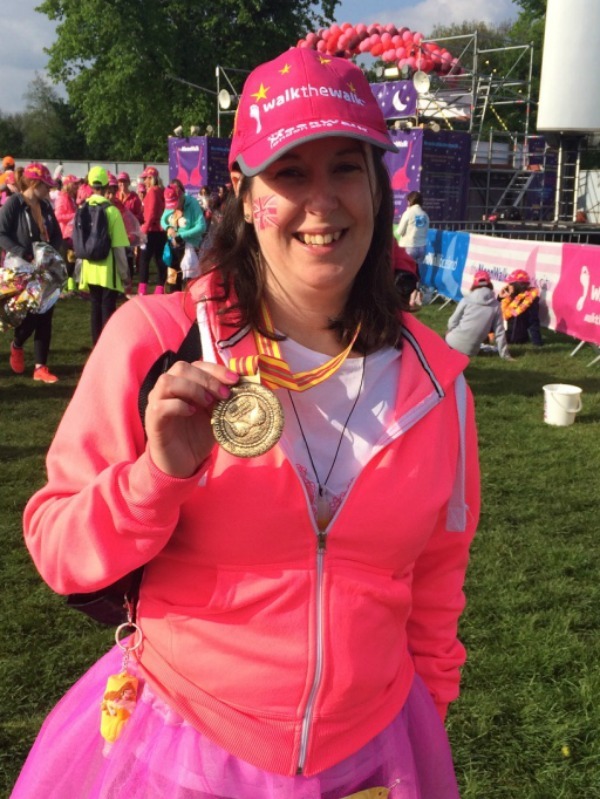 I am so glad I completed the Moon Walk, what an achievement. My time was approximately 8 hours 15 minutes which took into the account lots of stoppages for traffic and toilet queuing. I wore trainers on my feet but I learnt from that mistake and all of my walks since then have been in walking boots like my Hi-tec pair. Well done to you! what a great achievement! it must be fun to do it with friends! boo to the chaos! hope they managed it better next time! I am so glad I completed it definitely. You’ve got it in a nutshell, so amazing and so horrendous at the same time. My fitbit showed 52k steps on the Sunday but overall I believe it was around 65k steps for the 26.2 miles as we started around 11pm.